Material set aside by instructors for students to read, listen, or view, such as class notes, homework sets and assigned reading. Some high use items such as test preparation guides or previous editions of textbooks. Course Reserve is included in the Library Toolbox embedded in the Canvas. Students can access reserve materials, such as e-books, e-journal articles, e-lecture notes, 24 hours a day through the campus network, regardless of library opening hours or the availability of materials. 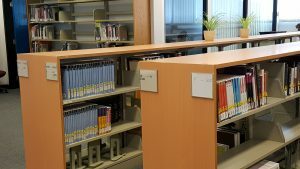 Physical items, such as library books, journal articles, personal books, etc., may be borrowed for a short period (2 hours, 1 day, 3 days, or 7 days). Very high fines may incur when overdue. Media items, such as videos and music CDs, etc., may be borrowed for 3 hours and used inside the Library only. Very high fines may incur when overdue. Use the Library Catalog’s Course Reserve, search by course name or instructor’s name to find what you need. E-Reserve items are accessible online via the “View Document” link in the Catalog record. If it is not available electronically, jot down the call number of the item you want. For Print Reserve or Media Reserve, go to the Circulation Counter (G/F) and give the staff the call number. Library staff will fetch the material for you. For 2-hour loan items, if you borrow it within two hours before the Library closes, you may keep it overnight; you must return it within the hour after the Library opens on the following day. However, Media Reserve items are for library use only. You need to return it before the Library closes. You cannot renew the loan for Reserve items. After you return the item, if no one requests it, you may check it out again. All print reserve items are requestable. Only 2-hour and 1-day loan items have to be held in person at the Circulation Counter. Counter staff will hold it for you for 15 minutes and 60 minutes respectively. However, Media Reserve items are NOT requestable.